The following project outline is provided solely as a guide. 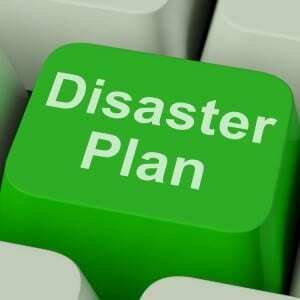 It is only intended to be “one example” of requirements for a disaster recovery project plan. It is not, by any stretch of the imagination, the only way to set up a project plan. If you are new to disaster recovery planning, make sure that you research the subject thoroughly before embarking on a disaster recovery planning project. Consider engaging a consultant (internal or external to your organization) to help you in your project planning effort. Disaster recovery planning is not a two-month project, neither is it a project that once completed, you can forget about. An effective disaster recovery planning plan is a live recovery plan. The plan must be maintained current and tested/exercised regularly. Historically, the data processing function alone has been assigned the responsibility for providing contingency disaster recovery planning. Frequently, this has led to the development of recovery plans to restore computer resources in a manner that is not fully responsive to the needs of the business supported by those resources. Contingency planning is a business issue rather than a data processing issue. In today’s environment, the effects of long-term operations outage may have a catastrophic impact. The development of a viable recovery strategy must, therefore, be a product not only of the provider’s of the organization’s data processing, communications and operations centre services, but also the users of those services and management personnel who have responsibility for the protection of the organization’s assets. Defining how contingency planning considerations must be integrated into ongoing business planning and system development processes in order for the plan to remain viable over time. The successful and cost effective completion of such a project requires the close cooperation of management from all areas of Information Systems as well as business areas supported by Information Systems. Senior personnel from Information Systems and user areas must be significantly involved throughout the project for the disaster recovery planning process to be successful. develop a comprehensive plan that will enable the organization to react appropriately and in a timely manner if disaster strikes. Since disaster recovery planning is a very complex and labor intensive process, it therefore requires redirection of valuable technical staff and information processing resources as well as appropriate funding. In order to minimize the impact such an undertaking would have on scarce resources, the project for the development and implementation of disaster recovery planning and business resumption plans should be part of the organization’s normal disaster recovery planning activities. The proposed project methodology consists of eight separate phases, as described below. Phase 1 is used to obtain an understanding of the existing and projected computing environment of the organization. This enables the project team to: refine the scope of the project and the associated work program; develop project schedules; and identify and address any issues that could have an impact on the delivery and the success of the project. During this phase a Steering Committee should be established. The committee should have the overall responsibility for providing direction and guidance to the Project Team. The committee should also make all decisions related to the disaster recovery planning effort. The Project Manager should work with the Steering Committee in finalizing the detailed work plan and developing interview schedules for conducting the Security Assessment and the Business Impact Analysis. Security and control within an organization is a continuing concern. It is preferable, from an economic and business strategy perspective, to concentrate on activities that have the effect of reducing the possibility of disaster occurrence, rather than concentrating primarily on minimizing impact of an actual disaster. This phase addresses measures to reduce the probability of occurrence by monitoring. A Business Impact Assessment (BIA) of all business units that are part of the business environment enables the project team to: identify critical systems, processes and functions; assess the economic impact of incidents and disasters that result in a denial of access to systems services and other services and facilities; and assess the “pain threshold,” that is, the length of time business units can survive without access to systems, services and facilities. During this phase, a profile of recovery requirements is developed. This profile is to be used as a basis for analyzing alternative recovery strategies. The profile is developed by identifying resources required to support critical functions identified in Phase 3. This profile should include hardware (mainframe, data and voice communications and personal computers), software (vendor supplied, in-house developed, etc. ), documentation (DP, user, procedures), outside support (public networks, DP services, etc. ), facilities (office space, office equipment, etc.) and personnel for each business unit. Recovery Strategies will be based on short term, intermediate term and long term outages. During this phase, recovery plans components are defined and plans are documented. This phase also includes the implementation of changes to user procedures, upgrading of existing data processing operating procedures required to support selected recovery strategies and alternatives, vendor contract negotiations (with suppliers of recovery services) and the definition of Recovery Teams, their roles and responsibilities. Recovery standards are also be developed during this phase. The approach taken to test the plans depends, in large part, on the recovery strategies selected to meet the disaster recovery planning requirements of the organization. As the recovery strategies are defined, specific testing procedures should be developed to ensure that the written plans are comprehensive and accurate. Although statistically the probability of a major disaster is remote, the consequences of an occurrence could be catastrophic, both in terms of operational impact and public image. Management appreciates the implications of an occurrence, therefore, it should assign on-going responsibility for recovery planning to an employee dedicated to this essential service. The project team organization is designed to maximize the flexibility needed to deal with the implementation of a plan in the most efficient manner possible. As explained earlier in this document, disaster recovery and business resumption planning is a complex and labour intensive program. A key factor in the successful development and implementation of recovery and resumption programs in other organizations is the dedication of a full-time resource to recovery/business continuity planning. Recovery plans should be treated as living documents. Both the information processing and the business environments are constantly changing and becoming more integrated and complex. Recovery plans must keep pace with these changes. Continuous testing/exercising of plans is essential if the organization wants to ensure that recovery capability is maintained in such an environment. The organization also must ensure that staff with recovery responsibilities are prepared to execute the plans. This cannot be achieved without a full-time resource with responsibility for: maintaining plans; coordinating components and full plan tests; training staff with recovery responsibilities; and updating plans to reflect changes to the information processing and business environments. The composition of the Project Team may vary depending on the environments and business units for which plans are developed. It is important to note that the managers of environments and business units for which plans are developed will be responsible for the maintenance and testing of their respective plans. However, the Person/unit responsible for recovery/continuity planning should retain the role of co-ordinator of testing activities, major plan revisions and maintainer of the Master Plan. The Core Project Team is automatically part of other project teams. Internal Audit should be invited to be part of all teams. The managers represented on the various teams may choose to recommend other senior individuals in their area to represent them or to join specific teams where their expertise will be required for the development of the plans. The members of the various Business Unit teams will be different for each Business Unit. The management and control for this project should be supported by project management software. The software should be used for scheduling of personnel resources to specific tasks and identification of end deliverables and their target completion dates. Recovery Planning software implemented during Phase 2 of the project will be used to document the plans. During Phase 1 activities, detail work plans for Data Processing and user personnel identifying tasks and responsibilities along with their associated start and completion dates will be developed. The following is a schedule of deliverables by phase that will be developed and delivered as part of this project. Organization who have tried to develop disaster and business resumption plans without dedicating the required resources to the effort have been largely unsuccessful in implementing effective recovery plans. Some organizations, after spending time and money developing recovery plans, have failed in maintaining their recovery capability. This is mostly due to a lack of commitment to keep their plans current or to do regular testing of recovery capabilities. It is therefore essential, that management is committed to the development, implementation and maintenance of this program, that required resources are freed up during the development cycle and that a resource be dedicated to the on-going maintenance of the program. A large volume of data will be gathered during various stages of the plan development. This data will be essential to the plan and has to be maintained on an on-going basis. There are several products on the market that have been designed to support the development, testing and maintenance of recovery plans. These products are evaluated during Phase 2 of the project. The final cost depends on the product chosen. Other one-time costs may include the purchase of equipment related to establishing redundancy in the area of voice and data communications, data processing equipment (including personal computers), data processing emergency support and backup equipment (such as UPS, diesel generators, etc.) and business equipment (photocopiers, FAX machines, etc. ).